“The name ‘Green Team’ doesn’t equate to the money green,” explained Matt Hotaling with a smile. That’s why Hotaling and his First Colonial High School (FCHS) colleague Diane Polk applied for a Virginia Beach Education Foundation (VBEF) sustainability impact grant earlier this school year. The $1,000 VBEF grant, funded by Lifetouch, has supported the collaborative efforts of students in Polk’s Green Team and Hotaling’s leadership skills class to promote sustainability. 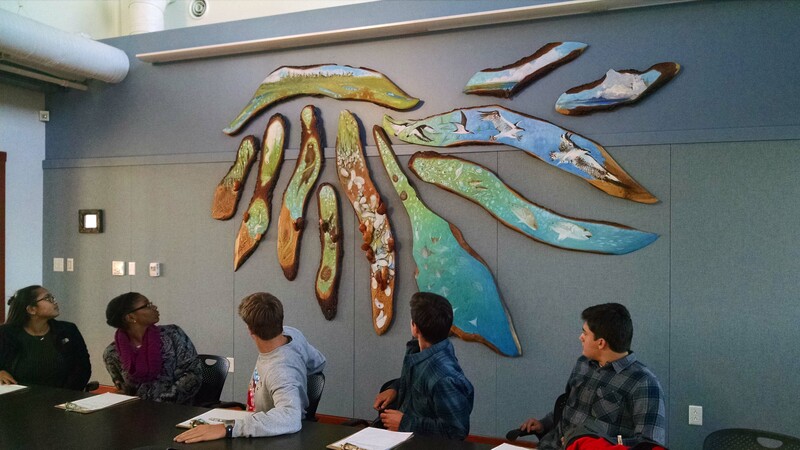 Green Team members visit the Chesapeake Bay Foundation’s Brock Environmental Center. 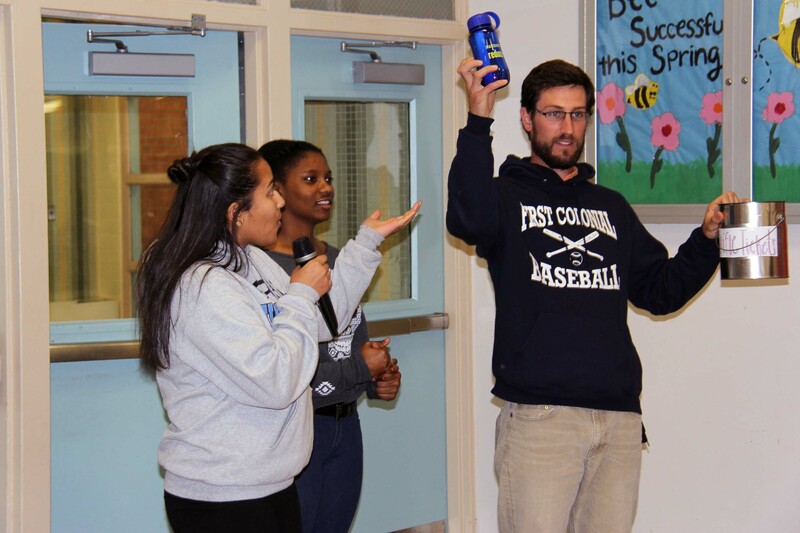 The students’ months of research and work with local organizations, such as Lynnhaven River Now and the Chesapeake Bay Foundation, culminated on Earth Day, April 22, when the students began actively promoting the new bottle refill station purchased with the help of grant funds. 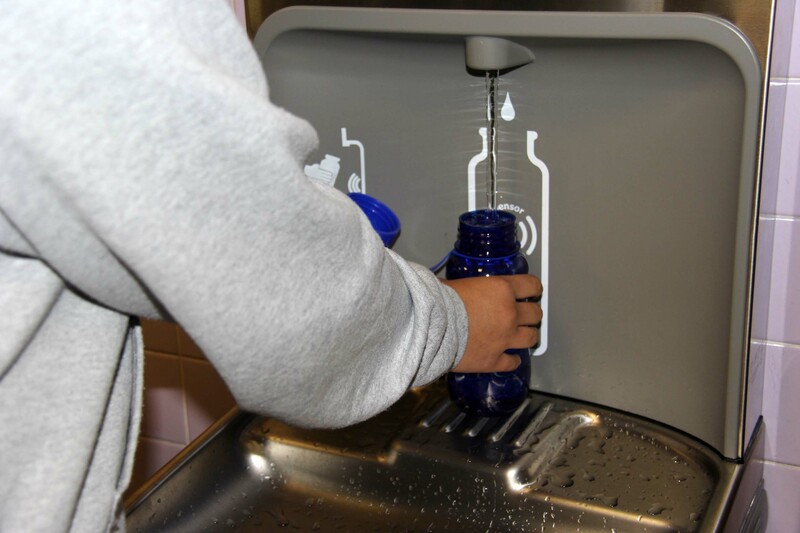 The refill station, attached to a water fountain in the school’s cafeteria, is sensor-activated with an automatic 20-second shutoff timer. 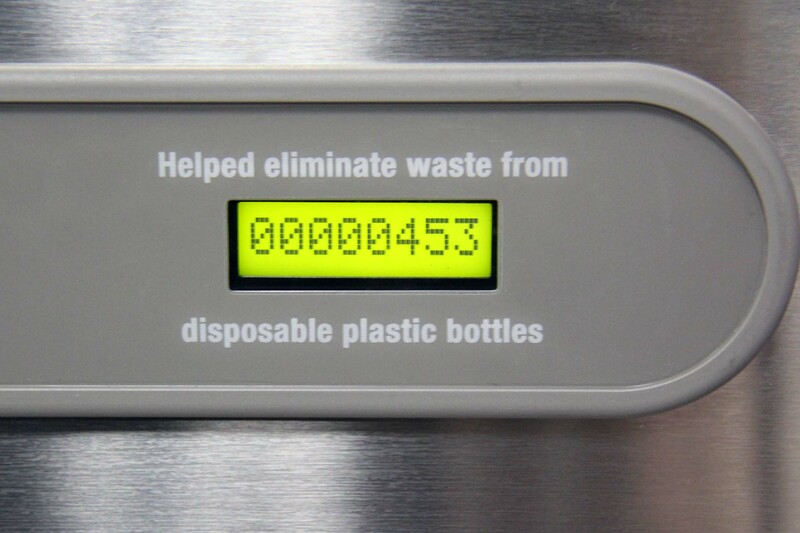 A counter on the station keeps track of the quantity of disposable plastic bottles saved from a landfill. After two weeks in operation, the refill station counter showed 453 bottles saved – and the count was increasing with each lunch block. “We got our numbers up this week. I think we went up about 200 this week,” said Green Team member and FCHS junior Mya Lind. She credits the Earth Day promotions for bringing awareness. Also bringing attention to the new refill station are the customized BPA-free, reusable water bottles that Lind, Aniya Jones and their fellow Green Team members are giving away during lunches. For each plastic bottle cap a student recycles, he/she earns the opportunity to win a “Patriots reduce” water bottle in the school colors of blue and yellow. Jones hopes the ease of donating one bottle cap or students bringing their own water bottles to refill will help encourage widespread awareness. “It unifies the student body because this is something everyone can get into. Instead of it being just for SCA or Green Team or a leadership course, this effort includes all students. Everyone can be a part of this,” she said. Lin, Jones and Hotaling call for bottle caps. As Jones, Lin and Hotaling make one final pass through the cafeteria to collect bottle caps from students before the bottle winner is announced, several students visit the water fountain to fill their bottles before going to their next class. There is unanimous agreement that the quick-fill rate of the refill station is the best feature. “After a few seconds, my water bottle is full,” says one student. “It’s quick and easy, and I don’t have to twist the bottle make sure I catch the water,” said another. Lind agreed that the refill station offers convenience as well. “The water flow from a typical water fountain can go up and down, and you have to move the bottle with it. It’s just a lot of work,” she said. “And it fills up the bottle all the way,” said Jones. Will the Green Team purchase more refill stations for the school? “We are trying to get one at the other end of the school by the gym,” Lind said. That will mean more of the “other” green Hotaling referred to earlier. If you or your organization is interested in supporting the Virginia Beach Education Foundation or learning more about other grant projects, visit www.vbef.org or contact VBEF coordinator Debbie Griffey at 757-263-1337 or debbie.griffey@vbschools.com.